Improved Performance Grooved discs with improved stopping power. Straight forward to replace, Origonal Manufacturer Replacement Parts. Specially designed Groove to permit a rapid check on brake disc wear. Brembo Max are coated, slotted discs which optimise performance in wet conditions, with constantly renewing friction material ensuring immediate braking response in all situations. The unique conformation of Brembo Max brake discs ensures increased braking power during the initial stages of braking thanks to a higher coefficient of friction: the results are shorter stopping distances and more effective braking action. 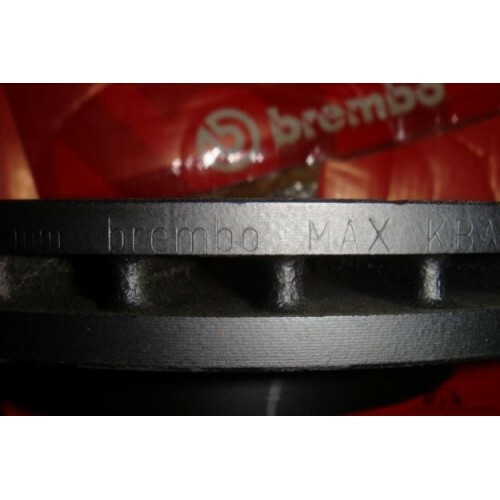 Furthermore, the special asymmetric grooves in the surface of Brembo Max discs expels the hot gases released by the friction material more rapidly while also indicating the degree of wear of the disc itself. 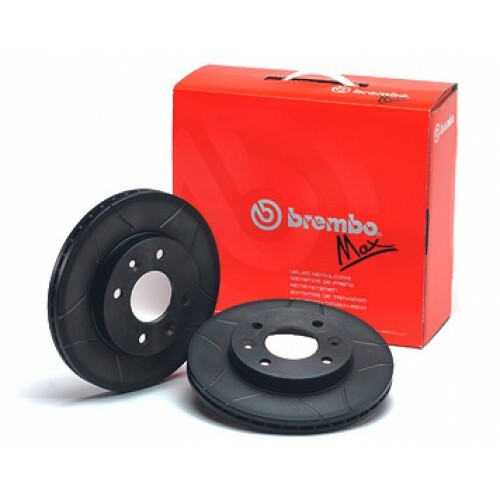 Brembo Max discs are particularly ideal for motorists for whom looks are also important: the surfaces not involved in braking are protected by a special anti-corrosion coating. This also eliminates the need to clean the disc before installation, reducing time and costs. One of the Brembo MAX grooves has been specially designed to permit a direct, rapid check on brake disc wear. When this groove is no longer visible, the recommended minimum thickness level has been reached; an indication that users should replace the worn disc. Even so, the braking system will still continue to function thanks to the remaining grooves. A similar wear indicator groove, positioned exactly opposite on the internal disc braking surface, ensures that the disc is perfectly balanced.